wpForo is forum software with a twist from the creators of WordPress. 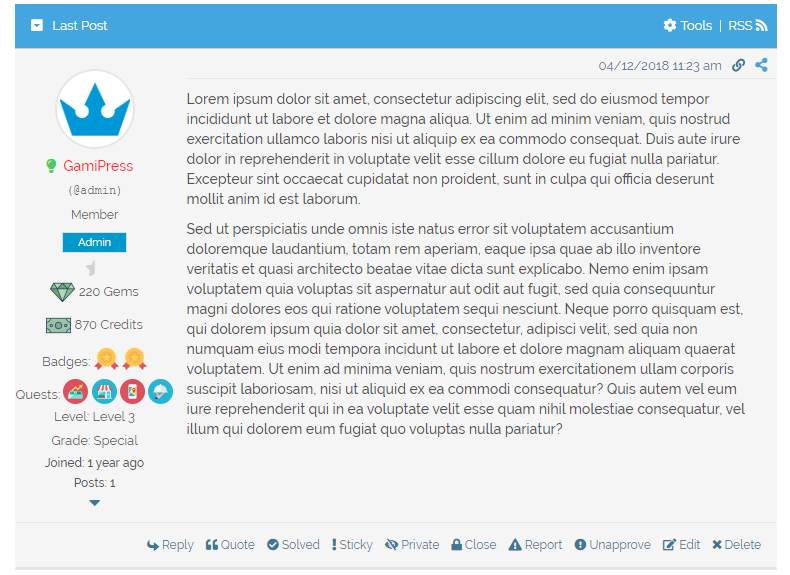 Easily setup discussion forums inside your WordPress powered site. Add gamification to your wpForo forums to engage your users to increase their activity! This plugin automatically connects GamiPress with wpForo adding new activity events. Drag and drop settings to select which points types, achievement types and/or rank types should be displayed on frontend reply author details and in what order. How can setup elements to be displayed at frontend on reply author details? After installing GamiPress – wpForo integration, you will find the plugin settings on your WordPress admin area navigating to the GamiPress menu -> Settings -> Add-ons tab at box named “wpForo”. Just choose the points types, achievement types and/or rank types to be displayed at frontend, setup the display options you want and click the “Save Settings” button.